Ultrasonication is used in many applications, such as homogenizing, disintegration, sonochemistry, degassing or cleaning. Below, you find a systematic overview over the various ultrasonic applications and processes. Please click at the items of the following list for more information on each process. 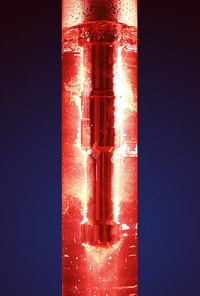 Ultrasonic processors are used as homogenizers, to reduce small particles in a liquid to improve uniformity and stability. These particles (disperse phase) can be either solids or liquids. Ultrasonic homogenizing is very efficient for the reduction of soft and hard particles. Hielscher produces ultrasonic devices for the homogenization of any liquid volume for batch or inline processing. Laboratory ultrasonic devices can be used for volumes from 1.5mL to approx. 2L. Ultrasonic industrial devices are used for the process development and production of batches from 0.5 to approx 2000L or flow rates from 0.1L to 20m³ per hour. Click here to read more about ultrasonic homogenizing! The dispersing and deagglomeration of solids into liquids is an important application of ultrasonic devices. Ultrasonic cavitation generates high shear forces that break particle agglomerates into single dispersed particles. The mixing of powders into liquids is a common step in the formulation of various products, such as paint, ink, shampoo, beverages, or polishing media. The individual particles are held together by attraction forces of various physical and chemical nature, including van der Waals forces and liquid surface tension. The attraction forces must be overcome in order to deagglomerate and disperse the particles into liquid media. For the dispersing and deagglomeration of powders in liquids, high intensity ultrasonication is an interesting alternative to high pressure homogenizers and rotor-stator-mixers. Click here to read more about ultrasonic dispersing and deagglomeration! A wide range of intermediate and consumer products, such as cosmetics and skin lotions, pharmaceutical ointments, varnishes, paints and lubricants and fuels are based wholly or in part of emulsions. Emulsions are dispersions of two or more immiscible liquids. Highly intensive ultrasound supplies the power needed to disperse a liquid phase (dispersed phase) in small droplets in a second phase (continuous phase). In the dispersing zone, imploding cavitation bubbles cause intensive shock waves in the surrounding liquid and result in the formation of liquid jets of high liquid velocity. At appropriate energy density levels, ultrasound can well achieve a mean droplet sizes below 1 micron (micro-emulsion). Click here to read more about ultrasonic emulsifying! Ultrasonication is an efficient means for the wet-milling and micro-grinding of particles. In particular for the manufacturing of superfine-size slurries, ultrasound has many advantages, when compared with common size reduction equipment, such as: colloid mills (e.g. ball mills, bead mills), disc mills or jet mills. Ultrasonication allows for the processing of high-concentration and high-viscosity slurries – therefore reducing the volume to be processed. Ultrasonic milling is suitable for processing micron-size and nano-size materials, such as ceramics, alumina trihydrate, barium sulphate, calcium carbonate and metal oxides. Click here to read more about ultrasonic wet milling and micro-grinding! Ultrasonic treatment can disintegrate fibrous, cellulosic material into fine particles and break the walls of the cell structure. This releases more of the intra-cellular material, such as starch or sugar into the liquid. In addition to that the cell wall material is being broken into small debris. This effect can be used for fermentation, digestion and other conversion processes of organic matter. 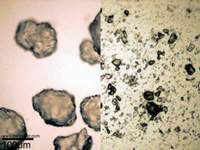 After milling and grinding, ultrasonication makes more of the intra-cellular material e.g. starch as well as the cell wall debris available to the enzymes that convert starch into sugars. It does also increase the surface area exposed to the enzymes during liquefaction or saccharification. This does typically increase the speed and yield of yeast fermentation and other conversion processes, e.g. to boost the ethanol production from biomass. Click here to read more about the ultrasonic disintegration of cell structures! The extraction of enzymes and proteins stored in cells and subcellular particles is an effective application of high-intensity ultrasound, as the extraction of organic compounds contained within the body of plants and seeds by a solvent can be significantly improved. Ultrasound has a potential benefit in the extraction and isolation of novel potentially bioactive components, e.g. from non-utilized by-product streams formed in current processes. Click here for more information about ultrasonic cell extraction! Sonochemistry is the application of ultrasound to chemical reactions and processes. The mechanism causing sonochemical effects in liquids is the phenomenon of acoustic cavitation. The sonochemical effects to chemical reactions and processes include increase in reaction speed and/or output, more efficient energy usage, performance improvement of phase transfer catalysts, activation of metals and solids or increase in the reactivity of reagents or catalysts. Click here to read more about the sonochemical effects of ultrasound! Ultrasonication increases the chemical reaction speed and yield of the transesterification of vegetable oils and animal fats into biodiesel. This allows changing the production from batch processing to continuous flow processing and it reduces investment and operational costs. The manufacturing of biodiesel from vegetable oils or animal fats, involves the base-catalyzed transesterification of fatty acids with methanol or ethanol to give the corresponding methyl esters or ethyl esters. Ultrasonication can achieve a biodiesel yield in excess of 99%. Ultrasound reduces the processing time and the separation time significantly. Click here to read more about the ultrasonically assisted transesterification of oil into biodiesel! Degassing of liquids is an interesting application of ultrasonic devices. In this case the ultrasound removes small suspended gas-bubbles from the liquid and reduces the level of dissolved gas below the natural equilibrium level. Click here to read more about the ultrasonic degassing of liquids! Ultrasound is being used in bottling and filling machines to check cans and bottles for leaks. The instantaneous release of carbon dioxide is the decisive effect of ultrasonic leakage tests of containers filled with carbonated beverages. Click here for more information about ultrasonic leak detection! To fight the dangerous Legionella bacteria in hot water systems and secure a safer showering environment the Gruenbeck company has developed the GENO-break® system. This system uses Hielscher ultrasonic technology in combination with UV-C light. Click here for more information about ultrasonically assisted disinfection! Ultrasonic cleaning is an environmentally friendly alternative for the cleaning of continuous materials, such as wire and cable, tape or tubes. The effect of the cavitation generated by the ultrasonic power removes lubrication residues like oil or grease, soaps, stearates or dust. Click here for more information about the ultrasonic cleaning! If your intended process is not listed above, please let us know. We have a number of customized ultrasonic devices and solutions that may meet your requirements. Ultrasound has evolved from an emerging technology, within the recent ten years and has developed into a fully commercial processing technology. High reliability and scaleablility as well as low maintenance costs and high energy efficiency make ultrasound a promising contender for established liquid processing equipment. Ultrasound offers additional exciting opportunities: Cavitation – the basic ultrasonic effect – allows for new results in biological, chemical and physical processes. While low-intensity or high-frequency ultrasound is mainly used for analysis, non-destructive testing and imaging, high-intensity ultrasound is used for the processing of liquids such as mixing, emulsifying, dispersing and deagglomeration, cell disintegration of enzyme deactivation. When sonicating liquids at high intensities, the sound waves that propagate into the liquid media result in alternating high-pressure (compression) and low-pressure (rarefaction) cycles, with rates depending on the frequency. During the low-pressure cycle, high-intensity ultrasonic waves create small vacuum bubbles or voids in the liquid. When the bubbles attain a volume at which they can no longer absorb energy, they collapse violently during a high-pressure cycle. This phenomenon is termed cavitation. During the implosion very high temperatures (approx. 5,000K) and pressures (approx. 2,000atm) are reached locally. The implosion of the cavitation bubble also results in liquid jets of up to 280m/s velocity. Ensminger, D. E. (1988): Acoustic and electroacoustic methods of dewatering and drying, in: Drying Tech. 6, 473 (1988). Kuldiloke, J. (2002): Effect of Ultrasound, Temperature and Pressure Treatments on Enzyme Activity an Quality Indicators of Fruit and Vegetable Juices; Ph.D. Thesis at Technische Universität Berlin (2002). Nyborg, W.L. (1965): Acoustic Streaming, Vol. 2B, Academic Press, New York (1965).